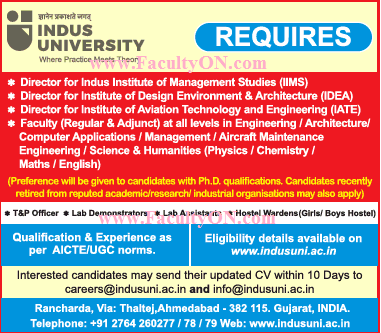 Indus University, Ahmedabad has advertised in THE TIMES OF INDIA newspaper for recruitment of Professors / Associate Professor / Assistant Professor / Director Plus Non-Faculty jobs vacancies. Interested and eligible job aspirants are requested to apply within 10 days from 04th April 2018. Check out further more details below. About University: Indus University (UGC Approved) is one of the leading universities in Gujarat. It aims to bring social changes with education, skill development, research and innovation. We provide diverse opportunities for students and faculties to improve their knowledge and skills to be successful in today's world.